Every fall, Esther and I like to do a weekend getaway. 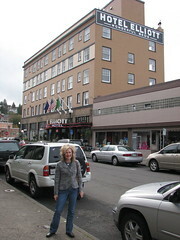 We often go to Leavenworth or the Oregon coast. Last minute reserving insured that the bavarian village would not host our outing. Turning our attention to the coast, we were reminded that some Portland friends had recommended lodging in Astoria. With some reservation we booked a room at the Hotel Elliot, a renovated hotel that looked inviting. We were pleasantly surprised by our stay in the historic city. The town seems to be on the upswing, with galleries and boutiques slowly taking over abandoned buildings. We thoroughly enjoyed the dining options. Since the weather was nice on Saturday, we went up to the Astoria Column, which overlooks the whole northwest tip of Oregon. It was great! I enjoyed the Columbia River Maritime Museum as well. Astoria is close to Seaside and Canon Beach, so we were able to catch the coastal thing before returning home.